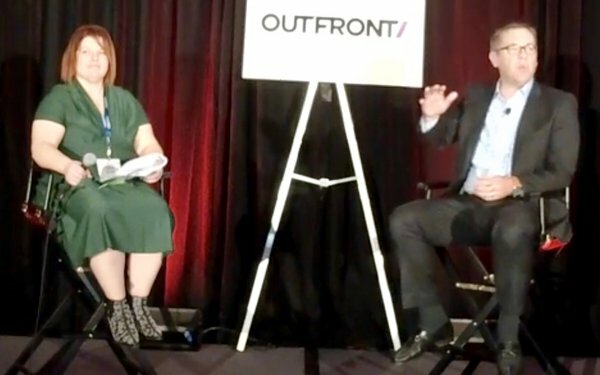 Infiniti’s 2018 marketing was examed in an interview between Tanya Gazdik, senior editor, automotive at MediaPost, and Phil O’Connor, director of marketing communications and media at Infiniti during Marketing:Automotive at the Los Angeles Auto Show on Nov. 27. Tanya: Infiniti is still a young brand but how has its image evolved? Phil: I really love this brand, it is young relative to some of our competitors. We’re 29 years old. Big 3-0 next year. But we’re not so young that we don’t have a heritage and a legacy. One of the things I really like about the role that I’m in and this brand is the fact that that allows us to have a leg to stand on but it’s not so rooted in those things that we can’t maneuver moving forward versus some brands that have such a strong history that they’re sort of staid and don’t have the ability to break out of the place that they’re in so. The other nice this is that if you look at the brand, the lines point to an infinite point, it’s all about moving forward and that’s what the brand has always been about as well and I love that logo. So we’re always looking forward to new ideas and I think that the 30 years, 29 years gives us the ability to leverage those things that we’ve done in the past, those innovations and the risk-taking that we’ve done but yet doesn’t confine us moving forward. T: Tell me about the Japanese Automotive Invitational at Pebble Beach and how it fit into all of the marketing activations that you had going on there. P: This was a big deal for us. I’m really proud of this. The Japanese Automotive Invitational, this was the first annual. For those of you familiar with Pebble Beach, you know that the Concourse has been the centerpiece of Monterey Car Week for a long time. But the event’s been morphing over the years so now what we’ve got is, Sunday, you have the Concourse but throughout the week, there’s all different kinds of events. At Infiniti, we’re very proud that we’re a Japanese luxury brand. And so we thought that bringing all of the great Japanese luxury brands together and celebrating that would be something really special and give us the ability to carve out a time and a place and build some excitement around Japanese design. And so we did that, we brought 44 historically significant Japanese cars together. There were a few Infinitis, certainly, our flagship, the 1989 Q45, we had an example of that vehicle and others but we had examples from all of the Japanese brands, celebrating every brand there. It turned out to be just a really fantastic celebration of Japanese heritage. T: So who were you trying to reach with that, a different demographic than you normally target, more Millennials perhaps? P: Well, certainly, the nice part about being in Pebble is that you’re reaching, you’re talking to influencers in the industry, people who have the wherewithal to be an influencer but also that incredible passion around cars. So we were trying to reach those folks but in a new way. But certainly Japanese, the tuner industry, the fans of tuner, of that genre tend to be younger, tend to be Millennials. We tend to sell to a bit younger audience than our competitors do so we thought that perhaps it would resonate with those folks and it did. It was a hugely successful. We didn’t know exactly what to make of this or what would happen. We ended up getting 8,000 people through this during the weekend so it was just packed. It allowed us to, when you talk about reaching a younger audience, we thought about that and one of the things we try to do is extend Pebble beyond Monterey because there’s a lot of interest nationally but it’s very had to bring the flavor of what happens that week to the national audience. This is drone footage, we pushed it out on social media, Motor Trend helped us put together the first Japanese car forum, which was packed. We had five experts talking about Japanese heritage and various Japanese cars of note. Karim Habibe is Infiniti’s chief designer and we had him come and do a very informal walk-through at this forum talking about elements of style that he found compelling, not just Infiniti and Nissan models but there were some really beautiful examples of Japanese historic cars that he talked about, we filmed it, pushed it out to social media and it was fascinating. It really allowed us to capture the magic of what the JI became and push it out nationally. We think this could become a staple of Pebble. It’s on Saturday so it’s right before the Concourse. Pebble was a partner in it and they loved it so this is something we look forward to building on for sure. T: You mentioned Motor Trend. Have they partnered with you for other marketing activities or was this a one-off and why are they a good partner? P: Motor Trend’s been a part of at Pebble for a number of years. We do partner with Motor Trend on other things, too. One of the things that I find really powerful about the partnership and other partners that we have, too, is they’re really valuable partners, the ones that are innovative and bring new ideas to the table and this is an example of that. We were challenging Motor Trend to innovate around what we were doing at Pebble and I think this speaks for itself. T: Let’s talk about cars. One year ago here in L.A. you launched Infiniti’s luxury mid-size crossover, the QX50. How did you approach the launch and are you happy with the results? P: i am a bit of a gear head. I love the industry and I’be been in it a long time. One of the things I think is a unique dynamic we haven’t seen before is the move to compact crossovers both in mainstream brands but even more so arguably in luxury so this segment now comprises over a third of all luxury sales. It’s astounding and it’s also astounding at how fast the change has happened. For us, we viewed this as potential the biggest launch in years maybe even in the brand’s history. We think the QX50 is the epitome of our brand position, the epitome of being human, daring and forward for a whole lot of reasons. We were also launching this pinnacle of our brand into a segment that comprises 35% of the business. It was a huge, important milestone for us. We tried to approach it as such and even the pre-launch activity that we did, we thought we would try something new with this. Our objective with our pre-sale was not to sell cars. We wanted to come up with a program that would create buzz and activity around the brand. We came up with a way to leverage crowd-sourcing so anybody who reserved a QX50 before we launched would get an incentive. The more people that reserved, the bigger the incentive got and that’s what was innovative. It gets the reservationist to share that they reserved the vehicle and hopefully generate more buzz and if their friends and family and others reserve, they’d get a bigger incentive and we actually reached beyond our expectations, reached the top level of incentive and sold more vehicles off the pre-sale buzz than we had anticipated so it was a really interesting way to generate the pre-launch demand and post that it was all about pulses throughout the launch that were innovative. We had the “Marvel Avengers:Infinity War,” which ended up being the largest movie in history. Conveniently, for us, they titled it Infinity so that was kind of nice. Then we used our Steph Curry relationship in the NBA playoffs, so big pulses through this launch so to answer your question, and now sales are exceeding expectations. It was all about building momentum in innovative ways. Yes, the product is growing, the segment is huge and it’s been important for us to reinforce what our brand stands for. P: Obviously, Infinity in the movie is spelled differently than our brand so the debate was, is this somehow compromising our brand in order to affiliate ourselves with the movie? It was Adam Chasnow, our executive creative director, we were debating this and he said what if we were to lean into it, to take advantage of this. He came up with this pneumatic where we switch a Y to and I and it became an effective way to draw people’s eyes to the spelling of our brand. The devil’s in the details. But that little simple idea saved the relationship and greatly enhanced the results of the program. That single little detail made a huge difference in the launch of the vehicle. T: You mentioned the NCAA. How did you interest the QX50 and what does that partnership mean to the brand? P: This will be our ninth year. We partner with the NCAA basketball coaches, with the NCAA coaches vs. cancer, it’s allowed us to give away over $8 million in the years that we’ve had the program to fight cancer and a host of other charities. My team, the whole Infiniti brand is so proud of this because this gives us an opportunity to give back and we take every advantage of that. T: What is next for Infiniti? P: Our CEO has made no bones about it, the future of Infiniti is electrification. That’s the direction the brand will be heading in the next few years. We’ve shown a couple of cars that I think demonstrate [his] vision for what that means. Electrification offers the possibility of different designs. Both the Q inspiration that was a hint at our next flagship sedan, and we just revealed the P10, an example of what an Infiniti electrified roadster might look like. It generated a huge amount of buzz. It’s here in L.A. for the auto show. We’re really proud of this. It’s definitely a hint as to what future Infinitis will look like. We just launched some new creative with a line, “Luxury should be lived in.” This notion is very important for us to differentiate ourselves from our competitors. It’s also important to tie back to what our brand has always stood for. This does both of those things. Our brand has never been one that’s precious, never been on that you put on a pedestal and you show it off. It’s much more personal than that. Moving forward, we’ll be inviting consumers to use our brand, to live with it. Supports the notion of empower the drive, offers us a new future as well.